In our previous post, we focused on understanding the relationship between sections and segments, which serve as the foundation for understanding the ELF file format. However, we will soon discover that we have ignored some degree of detail for the sake of simplicity. In the next couple of posts, we will focus on explaining the details behind Symbols and Relocations, which play a fundamental role in understanding the ELF file format in greater depth. In the development process of a program, we often use names to refer to objects in our code, such as functions or variables that are used all throughout the program. This information is what is known as the program’s symbolic information. Symbolic references in machine code get translated into offsets and addresses on the compilation process. However, compilers are not limited to machine code generation; they also export symbolic information from source code. Symbolic information is exported in order to improve the interpretation of the generated machine code. The ELF file format has a means to hold this symbolic information and provides an interface for local and external ELF objects to access it. 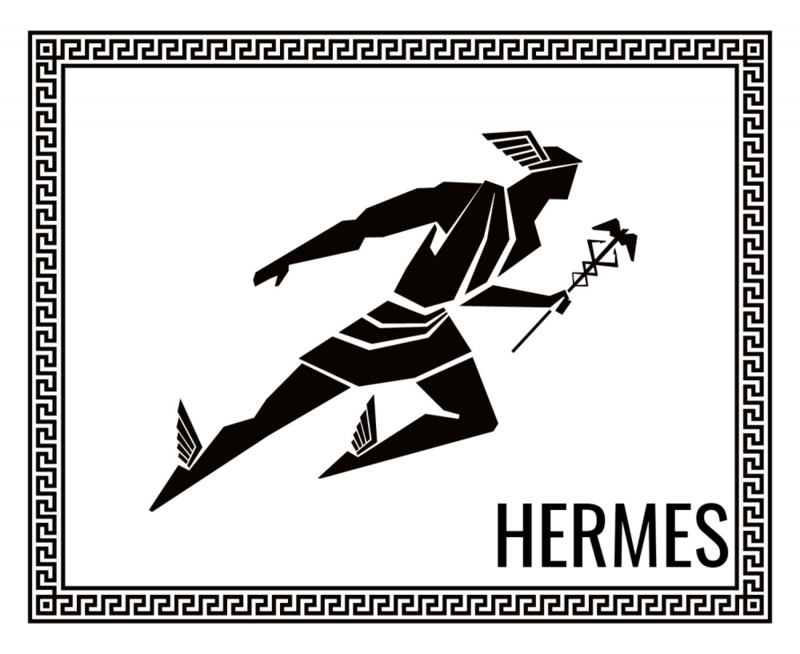 A wide range of tools interact with symbols to enforce their functionality. One example of these tools are Linkers. Linkers usually interact with a Symbol Table in order to match/reference/modify a given symbol inside an ELF object at linktime. Without Symbols, Linkers would not work, since they won’t know which relocations must take place, and therefore would not have a mechanism to match a given symbolic reference to its corresponding value. Another example of tools that heavily depend on symbolic information are Debuggers. Without Symbols, the process of Debugging can become considerably harder or even worthless, especially for projects with massive code bases such as the Linux Kernel. Debugging without symbols implies that one has no ability to identify functions or variables by name among other impediments. This would considerably reduce the features afforded by debuggers. 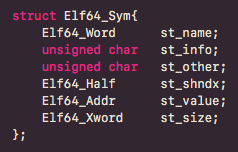 In the ELF file format, each Symbol is represented as an instance of an Elfxx_Sym structure inside a given Symbol Table. STB_LOCAL: Symbol is not visible outside the ELF object containing the symbol definition. STB_GLOBAL: Symbol is visible to all object files. STB_WEAK: Representing global symbols, but their definition can be overridden. STT_OBJECT: symbol is a data object (variable). STT_FUNC: symbol is a code object (function). STT_SECTION: symbol is a section. STV_DEFAULT: for default visibility symbols, its attribute is specified by the symbol’s binding type. STV_PROTECTED: symbol is visible by other objects, but cannot be preempted. STV_HIDDEN: symbol is not visible to other objects. STV_INTERNAL: symbol visibility is reserved. The major difference between symbol visibility and symbol binding is that the former is enforced on the host object of a given symbol and applies to any external object referencing it. Symbol binding, on the other hand, is specified by an external object referencing the symbol and is enforced at link-time. In other words, object binding depends on the object referencing the symbol, while symbol visibility depends on how the object containing the symbol was compiled. SHT_UNDEF: section is not present in current object. This value is typically set in symbols that have been imported from external objects. SHT_PROGBITS: section is defined in current object. SHT_SYMTAB, SHT_DYNSYM: Symbol Table (.symtab, .dynsym). SHT_STRTAB, SHT_DYNSTR: String Table (.strtab, .dynstr). SHT_REL: Relocation Table without explicit addends (.rel.dyn, .rel.plt). SHT_RELA: Relocation Table with explicit addends (.rela.dyn, .rela.plt). SHT_NOBITS: section takes no space in disk (.bss). st_value: This field specifies the symbol value for a given Symbol Table entry. The interpretation of this field can vary depending on the object type. For ET_REL files st_value holds a section offset. The section in which this offset resides is specified on its st_shndx field. For ET_EXEC / ET_DYN files, st_value holds a virtual address. If this field contains a value of 0 and the symbol’s section pointed by st_shndx has a sh_type field of type SHT_UNDEF, the symbol is an imported relocation, and its value will be resolved at runtime by the RTLD (ld.so). st_size: Field containing symbol’s size. A single ELF object may contain a maximum of two Symbol Tables. These are .symtab and .dynsym. The difference between these two instances involves the number and type of symbols they contain. We refer .symtab as the binary’s global Symbol Table, containing all symbol references in the current object. The section .strtab is the String Table of .symtab Symbol Table. String Tables store null-terminated strings used to reference objects from a different section. Each String Table contains the exact number of entries as its corresponding Symbol Table. This entails that each string entry at a given index in .strtab corresponds to an Elfxx_Sym entry at the same index in .symtab. On the other hand, we have .dynsym Symbol Table. This Symbol Table only holds symbols needed for Dynamic Linking. (We’ll cover Dynamic Linking extensively in future posts.) As an overview, when developing an application, sometimes we’d want to use symbols that don’t reside within the context of our program but are instead defined in external objects such as libraries (Shared Objects). Dynamic Linking is the process where the linker tries to dynamically bind those external symbols at runtime in order for them to be referenced safely within the context of a program. If a given binary has been stripped (.symtab/.strtab have been removed) and this same binary has been compiled so that a subset of its symbols will be dynamically linked, this subset of symbols can be recovered by parsing .dynsym table located at DT_SYMTAB entry within PT_DYNAMIC segment. For dynamically linked executables, .dynsym will not be removed even if target binary has been stripped, since it is needed at runtime by the RTLD in the process of Dynamic Linking. In this diagram, we see an example representation of various data structures from a binary containing the symbol _IO_stdin_used. This symbol is represented as the second Elf32_Sym instance in .dynsym Symbol Table. 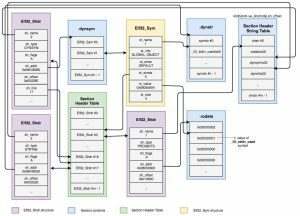 Note that .dynsym is a section represented as an Elf32_Shdr structure, and the index of its String Table within the Section Header Table can be retrieved by its Elf32_Shdr’s sh_link field. Moreover, This symbol resides within the .rodata section as shown by its Elf32_Sym st_shndx field, which denotes the fourth Elf32_Shdr instance within the Section Header Table. This Elf32_Shdr instance’s sh_name field points to the second null terminated string within the Section Header String Table, which is the ‘.rodata’ string. Furthermore, we can obtain _IO_stdin_used‘s attributes based on its Elf32_Sym instance. We can see that it is of type OBJECT, and its binding is of type GLOBAL. Therefore, we can assume this symbol is a Global variable. Note that the st_value field may lead to misconceptions since it contains a virtual address denoting the symbol’s location within its correspondent section, but not the actual value of the Symbol. We’ve covered the intricacies of Symbol handling within the ELF file format. We now have an understanding of what symbols are and their different uses. We have also covered the different types of Symbol Tables and how they correlate to different String Tables. In the next post, we will dive into Relocations and the Dynamic Linking process.